The Korean-style fried chicken is twice-fried and twice as good, minus the grease. 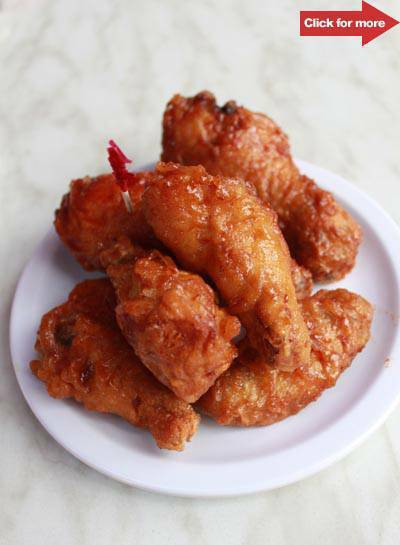 BonChon chicken is twice-fried and twice as good, minus the grease. Click for more photos. It's been called things like "crack chicken," "the best fried chicken in America," and "really addictive," but the real buzz about Bonchon should be this: twice-fried chicken is less greasy, and has less fat than regular fried chicken. The Korean franchise first made waves in Manila when its flagship restaurant opened at the Ayala Triangle Gardens last November. Foodies, curious onlookers, and hordes of the fried chicken-loving crowd stood in line at an already jam-packed restaurant for a taste of fried chicken cooked Korean-style: marinated in a sweet-and-salty soy garlic sauce, twice-fried, and served with a crisp that crackles. BonChon’s Greenbelt 1 branch, which opened last month, enjoys a quieter atmosphere than its Ayala Triangle counterpart.While the chicken wings are the real stars of this chicken chain, the fast food joint also serves chicken chops (fried chicken breast cooked like wings, P185/4 pcs), beef bulgogi wraps (P125), and a chicken sandwich (P125) served with tomatoes and lettuce. The chicken wings come in two flavors: soy garlic and hot and spicy. The magic, so it seems, lies in the skin. Each chicken wing and drumstick is brushed individually so the flavors are kept intact. You'll notice there's a space between the chicken skin and the meat when you bite into it-a void where a layer of chicken fat is supposed to be. The BonChon technique melts the fat away when it's fried twice (once on high heat, and again under low fire), while the delicate crispiness that emits a crackling-sound is a product of air-drying them until the skin is super crispy. The result? Moist, flavorful chicken meat that can best be enjoyed with tarty sides like pickled radish and kimchi cole slaw, or quite simply, a steaming cup of white rice. Other BonChon branches at Libis, Megamall, and Mall of Asia are set to open within the year.